With their first priest, Rev. Joseph Shary, pastor of St. Joseph Church in Chicago, IL, a group of 36 met at 6106 Columbia Avenue. At that time, the newly established church was named St. Josaphat and became the first Ukrainian Catholic Church in the State of Indiana. January 4, 1958 Father Shary celebrated the first Divine Liturgy in temporary quarters in a store building. By May 8, 1959 property was purchased at 7034 Columbia Avenue in Hammond, a home which the parishioners converted to a church, adding 3 steeples and with Mr. Lucyk constructing the first tabernacle of wood and mother of pearl. The first Liturgy in the new church was celebrated by Rev. Vladimir Wiwcharowsky. The new parish soon began religious instruction, Ukrainian and folk dancing classes for the children. Parishioners donated a Chalice, Vestments and money for all necessary liturgical appurtenances. A Senior Altar Rosary and Holy Name Societies were established. By September 18, 1959 a rectory was purchased at 1123 - 170th Place, Hammond, Indiana. Various fundraisers were started to finance the expenses of the new church. By May 1, 1960 the burning of the mortgage was held at the Sviachene dinner at Musician’s Hall, 7414 Indianapolis Blvd., Hammond, Indiana. On August 24, 1960 the church was dedicated by the late Archbishop Metropolitan the Most Reverend Constantine Bohachevsky. A new pastor, Rev. Raymond Kostiuk was assigned September 30, 1960. Many fundraisers were organized to benefit the church. Junior Altar Rosary and Junior Holy Name Societies were established. On December 25, 1962 Christmas was celebrated under the Gregorian Calendar. With the parish growing beyond the size of the small church, property at White Oak & Ridge in Munster was bought September 9, 1963. Rev. Joseph Martyniuk was assigned as new pastor February 9, 1964. By May 2, 1965, with the help of the bingo fundraisers, the mortgage for the new Munster property was burned. Groundbreaking ceremonies were held April 30, 1967 for a new church, with building commencing on May 5, 1967. The icon of Our Lady of Ocktyrka was donated to by Mr. Onufry Popyk May 12, 1968. That icon moved to its new home when the new church was dedicated and blessed November 10, 1968. On Sunday, November 10, 1968 the new church at White Oak and Ridge in Munster was blessed and dedicated. His Excellency, the Most Reverend Jaroslav Gabro, bishop of the new St. Nicholas Eparchy celebrated this first Divine Liturgy, with pastor Rev. Joseph Martyniuk. The new church had no iconostasis, chandelier or side icons; the front altar wall was the same brick as the outside wall. The entry and side walls had stained glass windows, but the new church was bare & had no choir loft. A Celebration Banquet was held after the Dedication in the adjoining attached hall, which was a bare-bones box room. Very Rev. Walter W. Wozniak was assigned as the new pastor on November 23, 1970. As the church originally was built with the minimum of finishing, improvements were continually being made. A chandelier was purchased for the church and cabinets for the sacristies and hall were installed May 7, 1971. The rectory was remodeled and improved. On the occasion of the 35th Anniversary of the Priesthood of Fr. Walter Wozniak, His Excellency Bishop Jaroslaw Gabro had a canonical visitation to the parish on November 10, 1974. Improvements to the church continued with the installation on December 21, 1974 of a choir loft. April 11, 1976 the Holy Name and Altar Rosary Societies donated the icons of Jesus Christ and the Mother of God, which were painted by Miss Christine Dochwat. November 16, 1977 the old church on Columbia Avenue in Hammond, Indiana was demolished. On September 16, 1979, the parishioners solemnly observed the 40th Anniversary of the priesthood of their pastor, Very Rev. Canon Walter W. Wozniak. For the glory of God, the church was beautified with Stations of the Cross painted in traditional style by the Studio of Mr. Boris Makarenko and donated by the Holy Name and Altar Rosary Societies January 20, 1980. Continuing to transform the holy space of the church, the dome inside the church was painted with icons by the Studio of Mr. Boris Makarenko November 7, 1980. November 23, 1981 the Studio of Boris Makarenko painted traditional elements on the walls, ceiling and dome of the church. Included was a new icon of Saint Josaphat on the wall behind the altar and the iconostasis was installed. To finish the church, new carpeting was installed November 24, 1981. The donations of the Holy Name and Altar Rosary Societies, sincere donations of the parishioners, income of social games and renting the parish hall made it possible to pay all costs of repairs and decoration of St. Josaphat Church. November 29, 1981 His Excellency Bishop Innocent Lotocky, OSBM had a Canonical Visitation of the parish and blessed the new Iconostasis, Stations of the Cross and all paintings in the church. A great celebration of parishioners and guests marked the occasion. The Silver Jubilee 25th Anniversary of the existence of the Parish of St. Josaphat was celebrated on November 27, 1983 with the kind presence of the beloved Bishop of St. Nicholas Eparchy, His Excellency Innocent Lotocky, OSBM, and other honorable guests. Throughout the year 1988, we marked the Millennium Anniversary of Christianity in Ukraine. Throughout the world, wherever Ukrainians lived, there was joy and celebration. In our own parish, there was celebration also, graced by a performance of our own Millennium Women’s Choir. Our church added a print and a bronze plaque commemorating the Baptism of the Ukrainian Nation as a permanent reminder of this great event. In 1989, the whole parish and many guests celebrated the wonderful Golden Jubilee 50th Anniversary of the priesthood of their pastor, Very Rev. Canon Walter W. Wozniak. Surely there are few times that one parish is blessed to be able to celebrate with their pastor not just one major anniversary, but several – and few attain that Golden Anniversary! During those last years of the pastorship of Father Walter W. Wozniak in 1989, we were also blessed to have a Canonical Visit by not only our dear Bishop Innocent Lotocky, but the head of the Universal Ukrainian Catholic Church, the Major Archbishop Myroslav Lubachivsky. It was an honor to have both the Bishop and the Major Archbishop and all our honored guests present here at our church in Munster, Indiana. In early 1991, due to declining health and advanced age, we were sad to see Father Wozniak retire. During the times of illness of Father Wozniak, Mrs. Mary Ann Woloch Vaughn began to assist in teaching religious education to young students, especially those who were about to receive First Holy Communion. We were sent a new pastor, Very Reverend Michael Stelmach who arrived in Munster in March of 1991. During the time Father Stelmach was with our parish, much was done to improve the rectory and further add to the beauty of God’s house, our church. Many items that are traditional to our Ukrainian Byzantine tradition, such as candles, incensers, rapidion, and icons for holy days, were donated by parishioners under the urging of Father Stelmach. Father Stelmach also instituted religious education classes for older children in weekly meetings. To support the church, the fundraising activity of making and selling pyrohy was began in 1991. That activity continues even to today, and without the efforts of the dedicated workers, our parish would not be the same. In September of 1992 we welcomed a new pastor, the first married priest to come to St. Josaphat. Very Rev. Pavlo Hayda, wife Christine and young son Julian were a bright addition to our parish. New altar cloths were donated by the Altar Rosary society with traditional Ukrainian embroidery. Under Father Pavlo’s direction, religious education for older students continued and there were instructional classes for adults too. As music was an important facet of liturgical services, Father Hayda also encouraged a choir to be formed for the English Liturgies that now were being offered once a month, and eventually every Sunday in addition to the Liturgy sung in Ukrainian. Shortly after the birth of their second son Zachary, we sadly bid farewell to the Haydas. Very Rev. Thomas Dobrowolski was assigned to our parish in July 1995. His time with our parish was short, as we again said farewell in November 1995. We welcomed a new pastor Very Rev. John Hritzko to St. Josaphat in December 1995. In January 1996 we were sad to learn of the passing of Father Wozniak. In 1997, the hall was remodeled to update it. For our St. Josaphat Feast Day in November 1997, we had a Canonical Visit from Bishop Michael Wichar who celebrated a Solemn Divine Liturgy for the occasion. We celebrated with Father John Hritzko his 10th Anniversary to the Priesthood in September 1999. While Father John was our pastor, we continued to improve the appearance of the church hall, including painting and new curtains for the stage. In the church itself, we improved the appearance with new carpeting for the nave and marble tiling for the altar. A festive Malanka was held in celebration of the New Century. By the end of 2003, we were bidding farewell to Father John Hritzko as he left for California. Our new pastor, Very Reverend Oleh Kryvokulsky began his term in January of 2004 and we welcomed Father and his wife Ludmilla and daughter Elizabeth. Some improvements were made to the rectory, including new windows and decorative white fencing for the backyard. In 2002, with the joint effort of Walter Zaokopny, John Wasyliw and Michael Medynsky, we added a shrine commemorating Christ’s suffering for our sins on Good Friday. A suitable decorative and protective case was made also by Mr. Wasyliw for our icon of Our Lady of Ochtyrka. In May of 2005 we took note that parishioner Vincent Sosnowski had started serving as an altar boy twenty years before in 1985. To this day, if help is needed and Vincent is present, he will assist the priest at services. December 31, 2006 was Father Oleh’s last day with our parish. Our new pastor is Very Reverend Yaroslav Mendyuk who officially was assigned to St. Josaphat Church starting January 1, 2007. September 4, 2007 we were shocked to learn of the untimely passing of our former pastor Father Pavlo Hayda in a tragic bicycle-car accident. May God watch over his wife Christine and four sons, and may we hold Father Pavlo in eternal memory. Vichnaya pamyat! Major renovations were made to the rectory in 2007 including many improvements to a house that had started many years ago as a farm house. Since Father Yaroslav became our pastor, we have donated new priestly vestments and a new chalice, plus added a traditional circular candle stand that uses thin beeswax candles for offerings. Mr. John Wasyliw, who over the years has crafted in wood many fine projects for our church, made twin stands to hold offering candles and donations. Repairs were made to the interior decorative painting that was starting to deteriorate in spots. The exterior dome was repainted as the weather had taken a toll on the surface of that dome. At our annual Sviachene Dinner March 30, 2008, we also celebrated 15 Years of the Priesthood for Father Yaroslav . 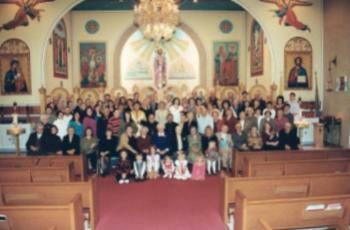 On Sunday, November 16, 2008 we celebrated the Golden Jubilee 50th Anniversary of St. Josaphat parish. Bishop Richard Stephen Seminack and many guest priests celebrated a Solemn Divine Liturgy with responses sung by a choir from Chicago led by Ms. Chrystyna Kosacz. This was also the day to bless an icon of the Last Supper that was added over the Royal Doors of the church’s iconostasis. Together we enjoyed a festive celebratory banquet held at Wicker Park Social Center. Many guests gave congratulatory speeches, the choir from Chicago had a choral presentation, and ambient and dance music was provided by John Pruzin Jr. and his All Star Tamburitizans. It was a memorable day in the history of St. Josaphat Church. May God grant all the members, friends and guests of St. Josaphat Parish many, many happy and healthy years! Mnohaya Lita! In 2010, the last surviving co-founder of St. Josaphat Parish, Mr. Joseph Lucyk passed to eternal life. May we always remember the efforts of all the original founders in establishing our parish of St. Josaphat in Northwest Indiana. Major renovation of the furnace and air conditioning system was undertaken after our fiftieth anniversary. Currently, we are renovating the bathrooms and starting collections to install a bell system that will chime and play traditional hymns when appropriate. From 2008 to 2015, under the guidance of Rev. Yaroslav Mendyuk, many spiritually uplifting retreats and entertaining events to encourage our feeling of community have occurred. There have been Lenten retreats to feed our souls. Parishioners organized several get-togethers not only to raise money, but to also give our parish family a chance to celebrate together. May 25, 2015 was Father Yaroslav’s last day with our parish. Our new pastor is Reverend Frank Avant who officially was assigned to St. Josaphat Church starting May 31, 2015. November 21, 2016 was Father Frank's last day with our parish. Our new pastor is Reverend Serhiy Kovalchuk who officially was assigned to St. Josaphat Church starting February 1, 2018. June 30, 2018 was Father Serhiy's last day with our parish. Our new pastor is Reverend Yuriy Sakvuk who officially was assigned to St. Josaphat Church starting October 23, 2018. As the parish of St. Josaphat continues in its second fifty years, we continue our primary mission: above all to worship God always, and to continue and enhance our understanding and practice of our Ukrainian Catholic tradition. We join with all the faithful members and clergy of St. Nicholas Eparchy in thanking God for His many blessings for the eparchy over the past fifty years since its inception. Mnohaya Lita!